All right you all. Let's put NumberNine, Undercover, and all these other children's Japanese games aside - let's talk about the MASTER. Yohji never ceases to amaze me, over and over again. His clothes are like architecture, and I love how he marches to his own (black) beat. I think he's great. I would also like to recommend Wim Wender's documentary about Yohji, Notebooks on Cities and Clothes. I actually have Notebooks on Cities and Clothes in my Netflix queue right now -- I can't wait to see it. 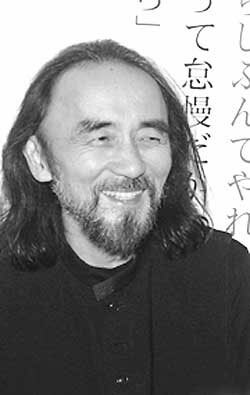 Yohji is one of the few designers who truly makes me see fashion as an art form by exemplifying it in his pieces. Yohji is someone who has grown on me a lot in the past few months. I think once I can afford his pieces, a lot of his things might find their place in my wardrobe. I also own his documentary on DVD, and I also recommend it. His A Magazine edition is also my favorite. I'll post some of my favorite looks in a bit. Faust, where did you find your photos? i really love yohji's womens clothes. i find his menswear is hard to figure out for me - the silhouette is something i figure out most of time - i appreciate bagginess but it doesn't look right the times i've tried much of his clothing. anyone have any insight on how to pull this off properly? i remember it being discussed briefly when the forum just started.. but the discussion didn't last too long. Yes, with Yohji you often either have to be fairly tall, or embrace the loose silhouette he promotes. He does - he wears his own cothes and somehow they look great on him. I have to say that his Y's line is much slimmer. I was eyeing a gorgeous knit coat from it, may still go for it. It's a nice mix between outerwear and a robe. I have two pieces from Yohji, both tops, and I love them. They are quirky and very high quality. not sure if this is all Yamamoto, but the gentleman has created quite a bit of debateon the Sartorialist blog. [quote user="xcoldricex"]i really love yohji's womens clothes. i find his menswear is hard to figure out for me - the silhouette is something i figure out most of time - i appreciate bagginess but it doesn't look right the times i've tried much of his clothing. anyone have any insight on how to pull this off properly? i remember it being discussed briefly when the forum just started.. but the discussion didn't last too long. in my opinion, it has more to do with your built. if you ownone of those dior model body type you will look out of place in yohji stuff. i have never had problem fitting into yohji items, i have a few tops and pants and they fit me pretty well. it might be because of my shoulder width and the result of working out which then sort of offsets the loose silhouette he creates. I have a love-hate relationship with Yohji. Conceptually, I love him. Practically, he makes me look like a homeless bum or someone who doesn't know what size he wears when I try to wear his garments. So, I'm with Faust and xcoldricex, I love the womenswear butcan only conceptually appreciatethe menswear. As others have mentioned, I am tall and skinny and usually look better in stuff from Helmut or Jil. So, the clothes really aren't made for me. If one is shorter or stockier (or shaped like Yohji himself), the look is great. But, God knows I've tried... having several friends who work for boutiques in Japan, I've had a veritable wardrobe of Yohji stuff from nearly all of his lines... from the mainlines to Y-3 to "Y's for Living," nearly all of which I later gave away to Japanese friends who made it look good. I couldn't make any of it work, except for a very few simple items. But, nevertheless, I think the stuff is so damn interesting I keep buying it. The piece I regret NOT buying most (perhaps of any in my life) was a black wool unstructured blazer with brownpaper stripes attached with fishing line, from which the paper was then partially removed (leaving the front of the jacket having strange stripes of ripped paper and fishing line). I could have had it for about $60 (6900 yen) and I passed. Stupid me... it was worth it for that just to keep in the closet as a collector's piece. ISo, I'm with Faust and xcoldricex, I love the womenswear butcan only conceptually appreciatethe menswear. As others have mentioned, I am tall and skinny and usually look better in stuff from Helmut or Jil. So, the clothes really aren't made for me. If one is shorter or stockier (or shaped like Yohji himself), the look is great. I disagreeYohji clothes are for the short and stocky. Hismodels on runway havedifferent body shapes. And I don't see any short and stocky salesperson inYohji shop in Tokyo, as I think, the salesperson in the store is the best model to presentthe image of the brand. Great thread guys, I would love the keep the discussion going. These are just some of my initial/random thoughts that I just wanted to get out there. I'll try and fix them up properly tomorrow. As with most of the others have said, conceptually, I love his clothing. However when it comes to wearing it I find myself a little torn. For me, personally, Yohji's clothes are more about how it makes you feel, rather than look. I find that his clothing gives the wearer a sense of air and ease about them self. But to wear them really well, I think first the wearer has to have that sense of comfort and ease already in themselves. Almost to the point where the wearer must cast away their unhealthy desires and be able to wholly embrace themselves. Which to me hints at an attitude linked to Buddhism and Zen. And by the way, Buckwheat, thank you for the picture. Thanks for the gorgeous portrait, Buckwheat. you are welcome Avantster and Laika. Nqth - would love to see your photo. I haven't seen either of those things, Buckwheat! Do you have any links? Laika - did you end up getting that Yohji top from Luisaviaroma? Laika - I have that i-D magazine on Yohji's interview. Just have to find some time to scan it. It's a fairly long article.